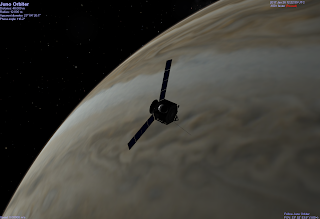 Over the last days, I have been playing around with creating a Celestia plug-in for the Juno mission. This has helped peak my interest into this spacecraft and what it might be able to accomplish at Io. 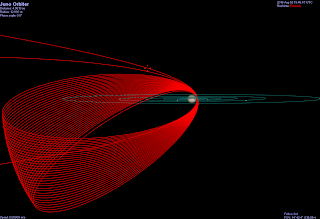 Juno is a New Frontiers-class mission with a launch planned for August 2011. Following an Earth gravity assist in October 2013, Juno will arrive at Jupiter in August 2016. Juno will then perform a 14-month orbital mission at Jupiter before plummeting into the giant planet's atmosphere in October 2017. The Juno mission is designed to investigate the internal structure and upper atmosphere of Jupiter and the magnetic and radiation environments near Jupiter with the goal of learning more about the origins of the gas giants. Juno will accomplish this through the use of six science experiments: Microwave Radiometer (MWR), the Jupiter Infrared Auroral Mapper (JIRAM), the Magnetic Field Investigation, Polar Magnetosphere Suite, Gravity Science Experiment, and JunoCAM. The orbital plan for Juno calls for 33 polar orbits of Jupiter. Each orbit except the first will last 11 days with Juno sweeping north to south at perijove. Perijove occurs at a distance of around 3500-4500 km above Jupiter's cloud tops and apojove occurs at a distance of 2.7 million km. This type of orbit allows Juno to map Jupiter's magnetic and gravity fields. More details on the types of science to be performed during perijove at Jupiter can be found in an animation on the Juno website. So what types of science could Juno perform at Io? There are three imagers on Juno: JunoCAM, JIRAM, and the Ultraviolet Spectrometer (UVS). These instruments are designed to be used near perijove and to be pointed at Jupiter. JunoCAM is a visible light, 3-color imager that will take images of Jupiter mostly for PR purposes. 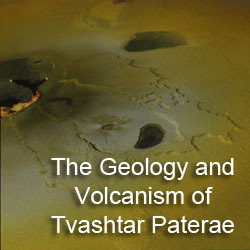 The camera will have a resolution of approximately 4 km from a distance of 5000 km. JIRAM is an infrared spectrometer designed to observe Jupiter's aurorae and atmosphere with spectroscopy between 2-5 microns and imaging at 3.4 microns. UVS will perform similar observations at ultraviolet wavelengths. 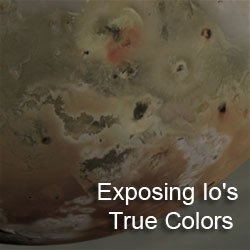 The biggest encumbrance to performing Io science with Juno is the low spatial resolution of the imagers on-board and their longevity in Jupiter's radiation environment. The best encounter of Io by Juno will occur on September 24, 2017 at a distance of 139,470 km. If Juno were to target Io at this time, JunoCAM's pixel resolution would be 111 km/pixel while for JIRAM it would be 35 km/pixel. So Juno's best images of Io would be on part with what New Horizons's RALPH instrument acquired, despite the order of magnitude improvement in distance. Another issue to keep in mind is that JunoCAM may not last much beyond the 7th orbit due to the high radiation environment at Jupiter. The closest approach during this time is on orbit 7 on December 24, 2016 at distance of 311,050 km. The projected pixel scale for this encounter would be 78 km/pixel for JIRAM and 249 km/pixel for JunoCAM. So, with such low resolutions for these cameras, what could Juno do at Io? I think JunoCAM would not be very useful at Io except for some neat shots of Jupiter rising above Jupiter, for example. The pixel scale is just too low otherwise to be useful. 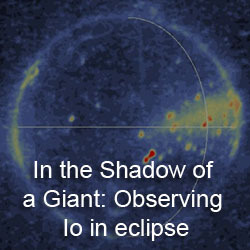 JIRAM could be very useful for temporal monitoring of Io's volcanic activity by observing Io either near closest approach or when Io enters eclipse. 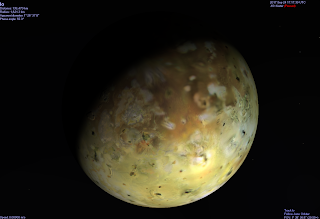 JIRAM seems to be capable of imaging Io at 75-100 km/pixel during most perijoves, which is equivalent to Galileo NIMS's better global observations. Now, whether Juno will observe Io with JIRAM is another question though, given how jam packed perijove will be with Jupiter science observations. The resolution for JIRAM will be sufficient for this kind of study though. It seems it might be useful for long term change monitoring of the visible regions (given that this is very different from an HST-like angle) but little else. This would definitely be true if it JunoCam manages to survive until the July and September 2017 encounters.